Puerto Carrillo or Carrillo beach is a coastal town that belongs to the province of Guanacaste on the Pacific coast of Costa Rica; is about 5 km from Samara beach. Carrillo beach has earned the prestigious Blue Flag, because of its efforts to maintain itself as one of the cleanest beaches in Costa Rica. In addition, this area is characterized by a pleasant atmosphere of tranquility, since the noise and distractions are minimal, which makes Carrillo beach the perfect location to relax and get away from the daily mess. Carrillo beach is not as developed as all the other neighboring beaches, here you will find some hotels, restaurants and bars, as well as tourist offices to help you enjoy diving, fishing, kayaking, snorkeling, sport fishing among others. It?s a good area for swimming and sunbathing; if you wish you can also stay at Samara beach, which has a higher range of hotels. Carrillo beach is full of palm trees, crystal clear waters, little crowded and white sand, make this quiet beach the perfect place to rest your vacations enjoying breathtaking scenery along the beach and beautiful sunsets. 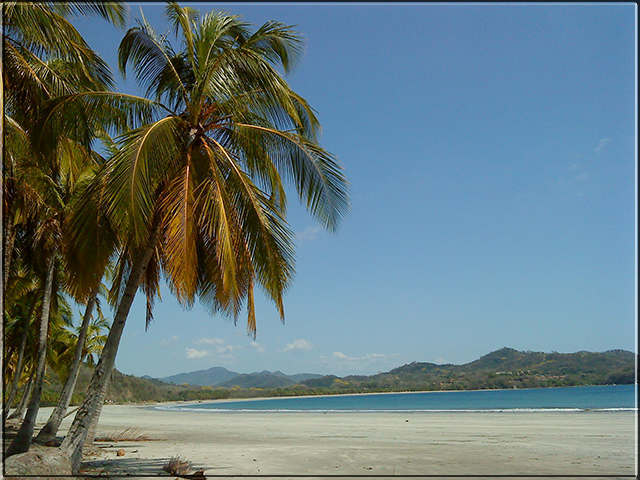 Carrillo beach is approximately four hours from San Jose, the capital of Costa Rica, or two hours? drive from Liberia Daniel Oduber International Airport. You can travel in shared transport with Interbus that offers transportation between the main tourist destinations of Costa Rica, this service is recommended for people who do not want to drive on unknown roads and want a comfortable and safe transportation service, Interbus offers different routes to and from Carrillo beach, do not hesitate to contact us and we will gladly give you all the information of schedules, prices and promotions, write to us at Info . Remember to book your ticket in advance. You can take a local flight from San Jose to Samara. The companies in charge of offering these local flights are Sansa and Nature Air, these flights would arrive at the airport in Samara, then you should take a taxi or a local transport to Carrillo beach. You can also choose to travel in public service. If you want to rest and enjoy your vacations in Costa Rica visit Carrillo beach, here you will find everything you need to have a fun time.